Today we’d like to introduce you to Danielle Black Lyons. 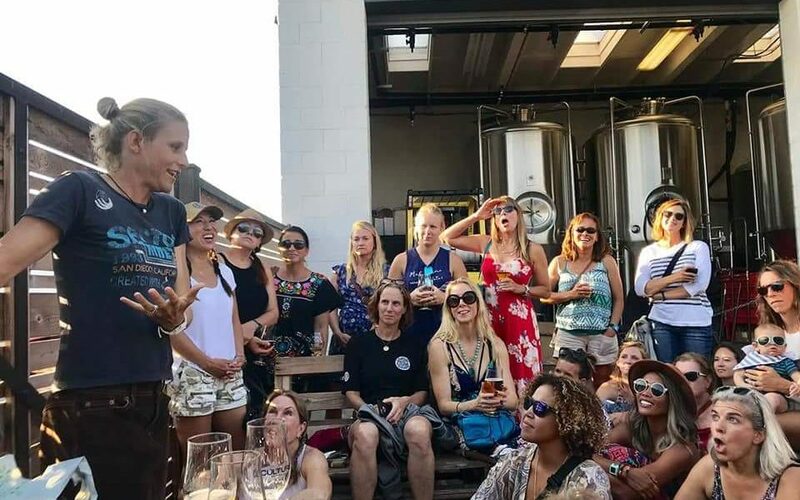 The San Diego Surf Ladies is a 501 (c) (4) non-profit that was created in 2004 by Jennifer Simmonson, a local surfer who wanted to create a group for women surfers to meet and empower one another in the water. The club has continued to grow over the past 14 years and we have over 250 active members throughout San Diego County. I joined the club in 2015 as a way to meet like-minded surf sisters, and I got exactly what I asked for and so much more. I loved the club so much in fact that I volunteered to handle their pr and social media presence for the past three years and this year, decided to take on the role of president. The club is run by an elected board and coordinators, so it’s a labor of love to keep things going. 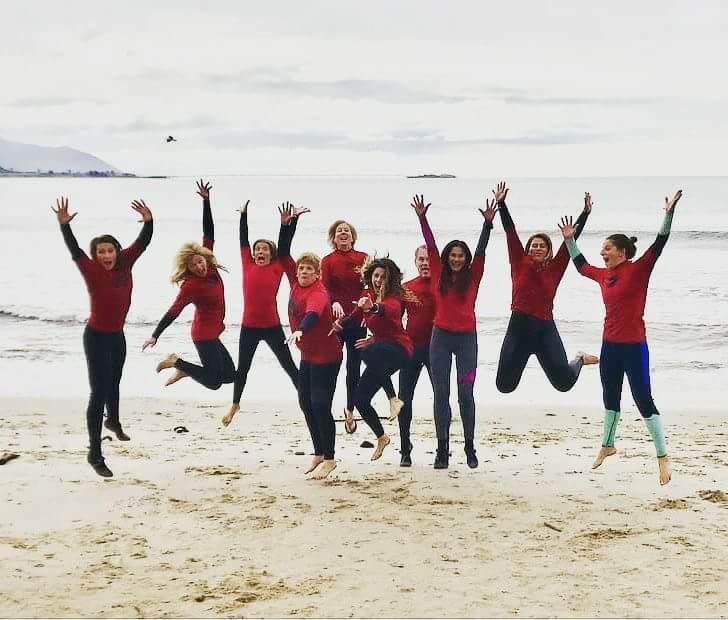 All of our members are passionate about surfing, ocean conservation and sharing the stoke that only a surfer knows when they are in connection with the sea. My personal love for the ocean started at a young age growing up on California’s colder, northern coastlines. I grew up boogie boarding with my brother and learned to surf my first year of college going home with a friend over winter break to the big island of Hawaii. I have loved surfing ever since; the culture, the lifestyle, the freedom it brings. 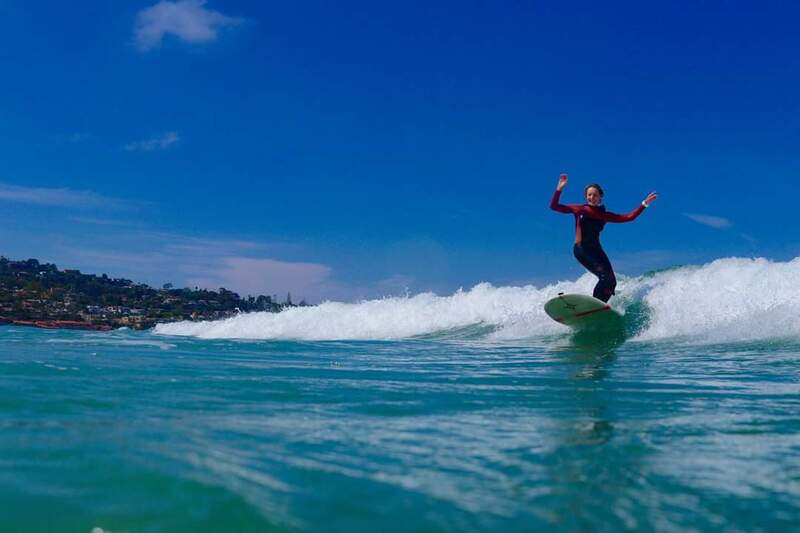 Now that I’m technically a grown up and have more daily stresses in my life like a mortgage a job, and a family that keeps me busy, I rely on surfing more than ever to keep my mind and body healthy. I surf daily before work, right after I drop my son at school. As a family, we can either be found on the beach or in the mountains hiking on weekends. I think every surfer faces challenges of injury from time to time. I had a year of back to back knee injuries that took me out of the water longer than I’d have liked. It’s all part of the process of progressing at your passion. You have to keep trying and failing to get better and perfect your craft. I think a big part of the intrigue of surfing is that it’s one of those sports you can’t conquer. Even the pros can’t control the elements of the ocean. Granted they have a wave pool now and that’s a whole other subject entirely, but as far as the ocean goes, you can’t predict what a wave is going to do. You can guess, you can study it, and it might be close to what you thought it might be, but it’s really about surrender and letting the ocean lead in the dance. 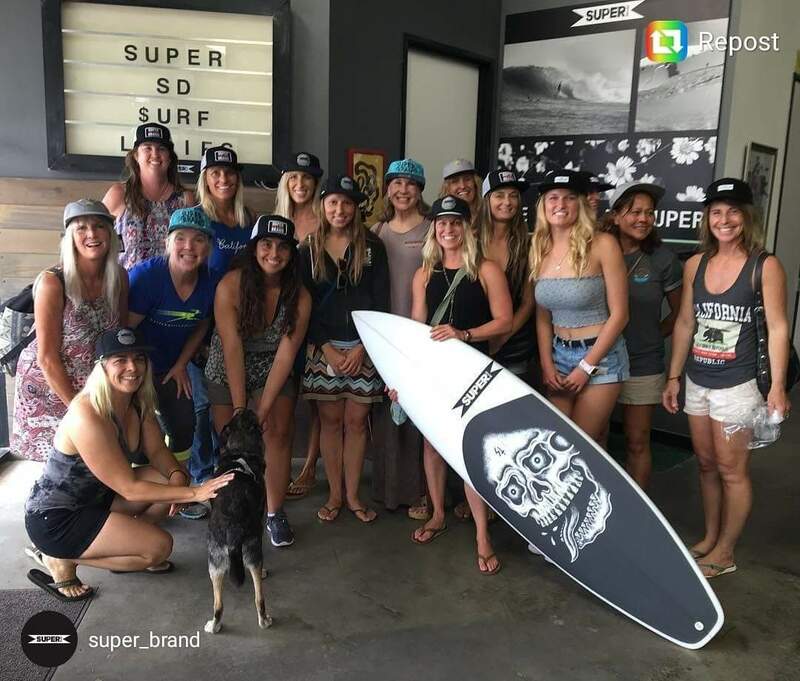 San Diego Surf Ladies’ mission is to bring together female surfers of all abilities to bond, have fun, share skills, and promote female surfing. 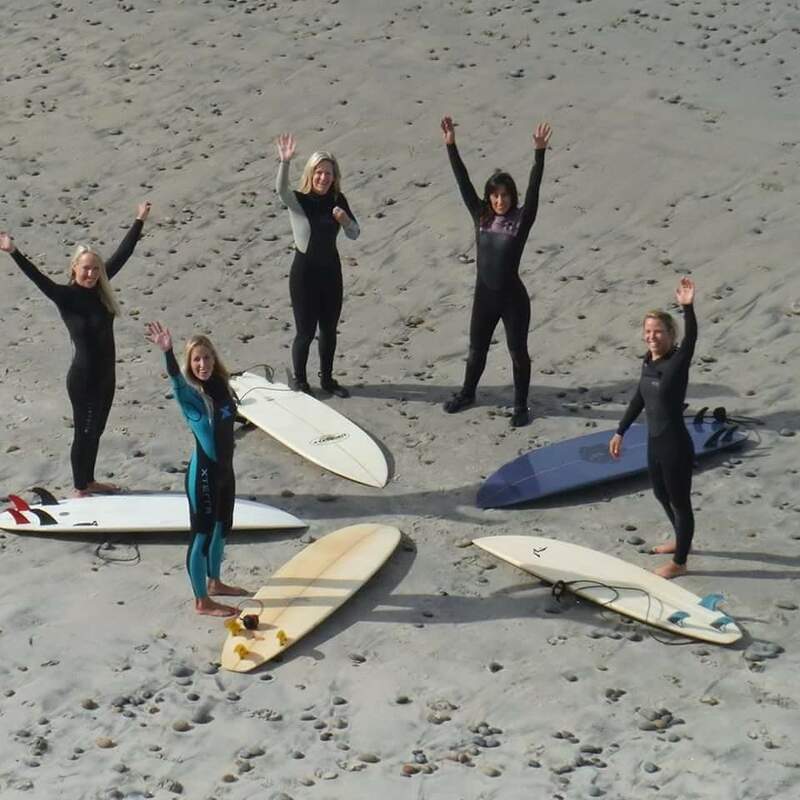 We are the only all-female surf club in the coalition of surfing clubs. We specialize in relationship building, stewardship, leaving our beaches more beautiful than we found them and having the most fun in the water. Our club has grown and evolved so much in the last five years; it’s hard to predict what direction the club will go with leadership ever-changing and fresh eyes at the helm every year or two. Right now our focus will be to maintain membership and give our ladies more of what they want; opportunities to develop surf skills with discounted coaching sessions, photo shoots and video analysis; continue our relationships with charities we care about like girls rising SD, groundswell and our adopted beach in Cardiff; monthly meetings with special guests who inspire through their work in the surf community. With wave pools becoming the new standard, by the way, we will continue to advocate for our coastlines.